Special limited edition run item for registered, Nightscaper 2019 attendees. 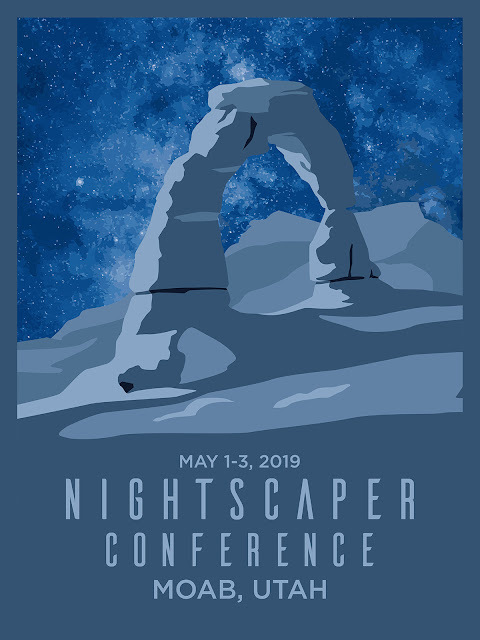 Luster printed 18"x24" commemorative poster for the first annual, 2019 Nightscaper Conference, taking place in Moab, Utah. This poster was designed by graphic artist and #LeaveItBetter activist, Phill Monson, who will also be at the conference exhibiting his unique outdoor designs on hats, shirts and stickers. Note: this is a pre-order item and will be delivered at the conference and will not be shipped (however, a mailing tube will be provide to protect your poster inside your luggage). 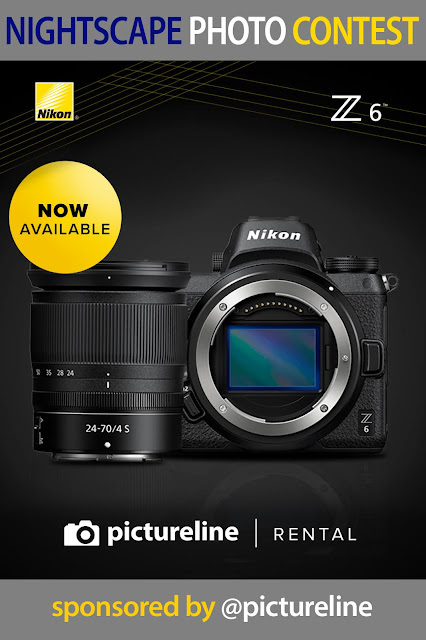 Check out Pictureline's RENTAL department for their list of photo equipment. 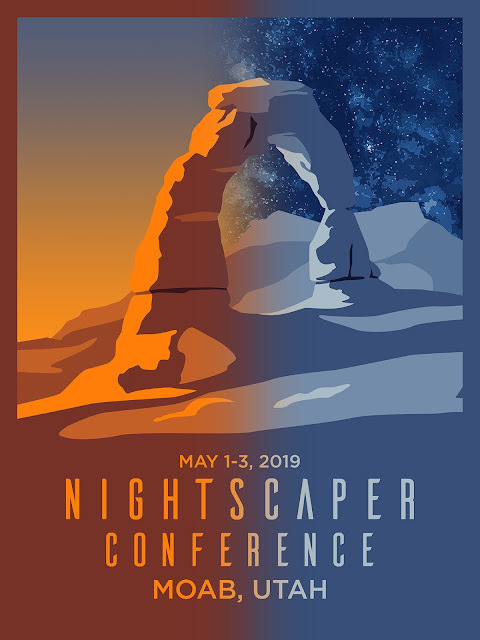 Pictureline is the main sponsor of the 2019 NightScaper Conference in Moab, Utah. JUDGING will be done by the Pictureline staff. Enter up to three (3) “NightScape” photos (any nighttime sky with a landscape foreground) by using the Instagram #PicturelineNightScape hashtag. Tag 3 other people in the comments of the @roycebairphoto Instagram post bearing the above image. Contest begins at 12:01 AM MST on February 18, 2019 and ends at 11:59 PM MST on February 22, 2019. 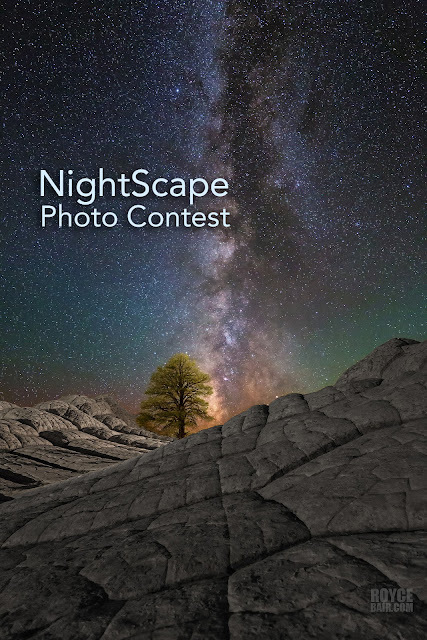 Only “NightScape” photos posted on Instagram with the #PicturelineNightScape hashtag are eligible to win. The date the photo was taken or created is not important, but the photo must be the sole creative work of the contest submitter. Contestants submitting more than three (3) images (via the use of the #PicturelineNightScape hashtag) will be disqualified. The Pictureline judges will determine the winners of this contest, and their decision is final and cannot be disputed. Contest winners will be announced here and via Direct Messaging, on or before March 1, 2019. Winners must claim and use their rental prize on or before August 1, 2019, or they will automatically forfeit their prize. Distributions of prizes may subject to rental equipment availability. Winners are responsible for any rental shipping charges or applicable taxes. Employees of Pictureline, Inc. and Stock Solution, Inc. (Royce Bair Photo), and their family members are not eligible to submit images for this contest. Eligibility: This Campaign is open only to those who submit images via the Instagram #PicturelineNightScape hashtag and who are 18 years of age or older as of the date of entry. The Campaign is only open to everyone of legal age, and is void where prohibited by law. Employees of Pictureline, Inc. its affiliates, subsidiaries, advertising and promotion agencies, and suppliers, (collectively the “Employees”), and immediate family members and/or those living in the same household of Employees are not eligible to participate in the Campaign. The Campaign is subject to all applicable federal, state, and local laws and regulations. Void where prohibited. Agreement to Rules: By participating, the Contestant (“You”) agree to be fully unconditionally bound by these Rules, and You represent and warrant that You meet the eligibility requirements. In addition, You agree to accept the decisions of Pictureline, Inc. as final and binding as it relates to the content of this Campaign. Campaign Period: Entries will be accepted online starting on 12:01 AM MST on February 18, 2019 and ending 11:59 PM MST on February 22, 2019. All online entries must be received by 11:59 PM MST on February 22, 2019. How to Enter: The Campaign must be entered by submitting an entry via the Instagram #PicturelineNightScape hashtag. The entry must fulfill all Campaign requirements, as specified, to be eligible to win a prize. Entries that are incomplete or do not adhere to the rules or specifications may be disqualified at the sole discretion of [your company name]. 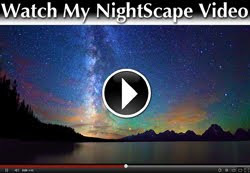 You may enter up to three (3) “NightScape” photos (any nighttime sky with a landscape foreground) by using the #PicturelineNightScape hashtag. You must tag three (3) other people. You may not enter more times than indicated by using multiple email addresses, identities, or devices in an attempt to circumvent the rules. If You use fraudulent methods or otherwise attempt to circumvent the rules, your submission may be removed from eligibility at the sole discretion of Pictureline, Inc.
Prizes: The Winner(s) of the Campaign (the “Winner”) will receive [list prizes and approximate retail value]. Actual/appraised value may differ at time of prize award. The specifics of the prize shall be solely determined by [your company name]. No cash or other prize substitution shall be permitted except at Pictureline's discretion. The prize is nontransferable. Any and all prize-related expenses, including without limitation any and all federal, state, and/or local taxes, shall be the sole responsibility of Winner. No substitution of prize or transfer/assignment of prize to others or request for the cash equivalent by Winner is permitted. Acceptance of prize constitutes permission for Pictureline, Inc. to use Winner’s name, likeness, and entry for purposes of advertising and trade without further compensation, unless prohibited by law. Winner Selection and Notification: Winner will be selected by [a random drawing or by community vote] under the supervision of [your company name]. Winner will be notified online and by Instagram's Direct Messaging within five (5) days following selection of Winner. Pictureline, Inc. shall have no liability for Winner’s failure to receive notices due to spam, junk e-mail or other security settings or for Winner’s provision of incorrect or otherwise non-functioning contact information. If Winner cannot be contacted, is ineligible, fails to claim the prize within 180 days from the time award notification was sent, or fails to timely return a completed and executed declaration and release as required, the prize may be forfeited and an alternate Winner selected. Receipt by Winner of the prize offered in this Campaign is conditioned upon compliance with any and all federal, state, and local laws and regulations. ANY VIOLATION OF THESE OFFICIAL RULES BY WINNER (AT [your company name]‘S SOLE DISCRETION) WILL RESULT IN WINNER’S DISQUALIFICATION AS WINNER OF THE CAMPAIGN, AND ALL PRIVILEGES AS WINNER WILL BE IMMEDIATELY TERMINATED. Rights Granted by You: By entering this content (e.g., photo, video, text, etc. ), You understand and agree that Pictureline, Inc., anyone acting on behalf of Pictureline, Inc., and Pictureline, Inc.'s licensees, successors, and assigns, shall have the right, where permitted by law, to print, publish, broadcast, distribute, and use in any media now known or hereafter developed, in perpetuity and throughout the World, without limitation, your entry, name, portrait, picture, voice, likeness, image, statements about the Campaign, and biographical information for news, publicity, information, trade, advertising, public relations, and promotional purposes without any further compensation, notice, review, or consent. DESPITE THE FOREGOING, PICTURELINE, INC WILL NOT KNOWINGLY USE YOUR ENTRY FOR ANY PUBLICATION OR PROMOTION THAT IS NOT DIRECTLY RELATED TO THIS CONTEST. By entering this content, You represent and warrant that your entry is an original work of authorship, and does not violate any third party’s proprietary or intellectual property rights. If your entry infringes upon the intellectual property right of another, You will be disqualified at the sole discretion of Pictureline, Inc. If the content of your entry is claimed to constitute infringement of any proprietary or intellectual proprietary rights of any third party, You shall, at your sole expense, defend or settle against such claims. You shall indemnify, defend, and hold harmless Pictureline, Inc. from and against any suit, proceeding, claims, liability, loss, damage, costs or expense, which Pictureline, Inc. may incur, suffer, or be required to pay arising out of such infringement or suspected infringement of any third party’s right. Terms & Conditions: Pictureline, Inc. reserves the right, in its sole discretion, to cancel, terminate, modify or suspend the Campaign should virus, bug, non-authorized human intervention, fraud, or other cause beyond [your company name]’s control corrupt or affect the administration, security, fairness, or proper conduct of the Campaign. In such case, Pictureline, Inc. may select the Winner from all eligible entries received prior to and/or after (if appropriate) the action taken by Pictureline, Inc. Pictureline, Inc. reserves the right, in its sole discretion, to disqualify any individual who tampers or attempts to tamper with the entry process or the operation of the Campaign or website or violates these Terms & Conditions. Pictureline, Inc. has the right, in its sole discretion, to maintain the integrity of the Campaign, to void votes for any reason, including, but not limited to: multiple entries from the same user from different IP addresses; multiple entries from the same computer in excess of that allowed by Campaign rules; or the use of bots, macros, scripts, or other technical means for entering. Any attempt by an entrant to deliberately damage any website or undermine the legitimate operation of the Campaign may be a violation of criminal and civil laws. Should such attempt be made, Pictureline, Inc. reserves the right to seek damages to the fullest extent permitted by law. Limitation of Liability: By entering, You agree to release and hold harmless Pictureline, Inc. and its subsidiaries, affiliates, advertising and promotion agencies, partners, representatives, agents, successors, assigns, employees, officers, and directors from any liability, illness, injury, death, loss, litigation, claim, or damage that may occur, directly or indirectly, whether caused by negligence or not, from: (i) such entrant’s participation in the Campaign and/or his/her acceptance, possession, use, or misuse of any prize or any portion thereof; (ii) technical failures of any kind, including but not limited to the malfunction of any computer, cable, network, hardware, or software, or other mechanical equipment; (iii) the unavailability or inaccessibility of any transmissions, telephone, or Internet service; (iv) unauthorized human intervention in any part of the entry process or the Promotion; (v) electronic or human error in the administration of the Promotion or the processing of entries. Disputes: THIS Campaign IS GOVERNED BY THE LAWS OF the United States of America AND the State of Utah, WITHOUT RESPECT TO CONFLICT OF LAW DOCTRINES. As a condition of participating in this Campaign, participant agrees that any and all disputes that cannot be resolved between the parties, and causes of action arising out of or connected with this Campaign, shall be resolved individually, without resort to any form of class action, exclusively before a court located in the State of Utah having jurisdiction. Further, in any such dispute, under no circumstances shall participant be permitted to obtain awards for, and hereby waives all rights to, punitive, incidental, or consequential damages, including reasonable attorney’s fees, other than participant’s actual out-of-pocket expenses (i.e. costs associated with entering this Campaign). Participant further waives all rights to have damages multiplied or increased. Winners List: To obtain a copy of the Winner’s name or a copy of these Official Rules, mail your request along with a stamped, self-addressed envelope to: Pictureline, 305 West 700 South, Salt Lake City, UT 84101 USA. Requests must be received no later than 11:59 PM MST on February 22, 2019. The Campaign hosted by Pictureline, Inc. is in no way sponsored, endorsed, administered by, or associated with Instagram or Facebook. 1. 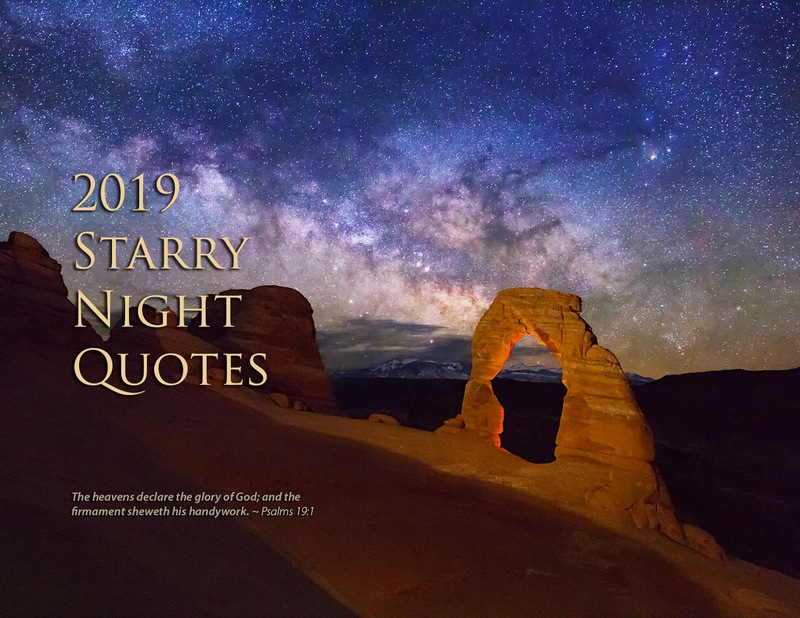 FREE Download for your hand-held device - You can download a PDF version (6MB) of this calendar to view on your hand-held device. 2. 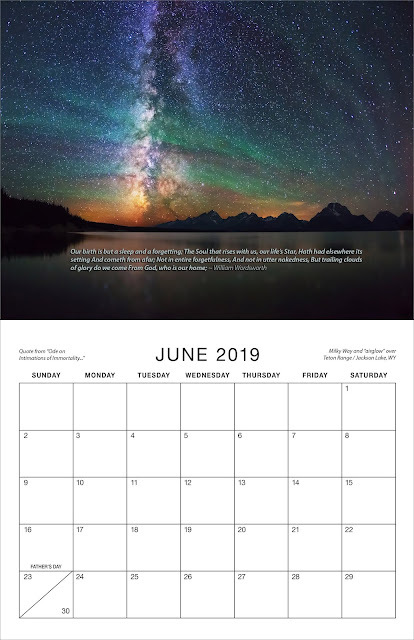 FREE download for printing - You can download a higher quality PDF version (26MB) to your computer and print out the calendar on you own inkjet or laser printer (14 - 8.5" x 11" sheets). 3. Order a Pre-printed calendar from my Etsy website for only $15.99 - This spiral-bound, 26-page wall calendar is printed on beautiful glossy coated card stock. Folded, it is 11" x 8.5". Hanging on your wall it is 11" x 17". Shipping is only within the United States. Delivery is by First Class mail while supplies last. 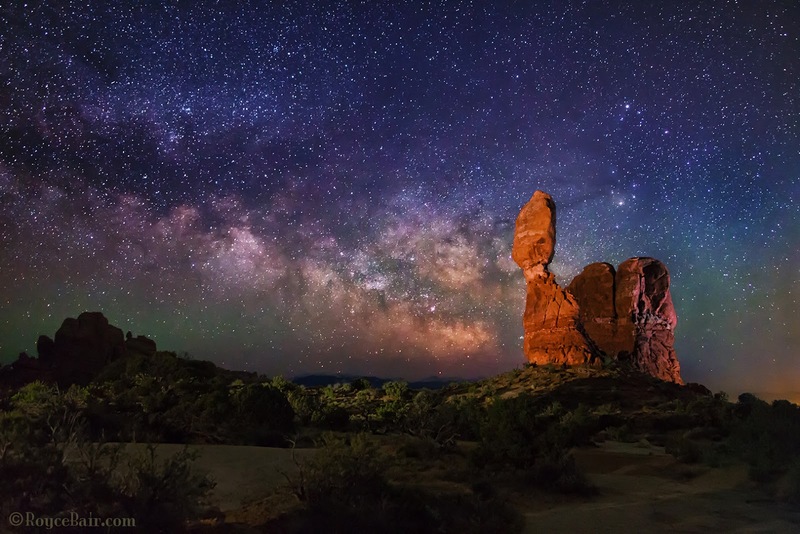 A Love Letter to the Night Sky from Ron Risman. 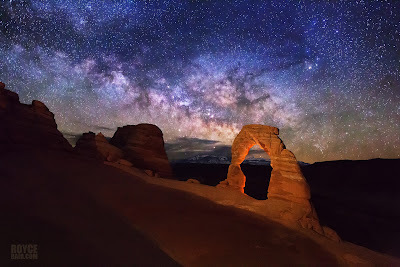 Many of these scenes were shot near Moab, Utah. The first annual NightScaper Conference has been scheduled for May 1-3, 2019 in Moab, Utah - gateway to Arches and Canyonlands. Poster design by Phill Monson / Entrada Outdoor Company. Day and Night activities scheduled each day. Tuesday, April 30, 2019 - check into any Moab hotel, or stay at the Marriott Springhill Suites and Fairfield Inn Suites (right next to each other). 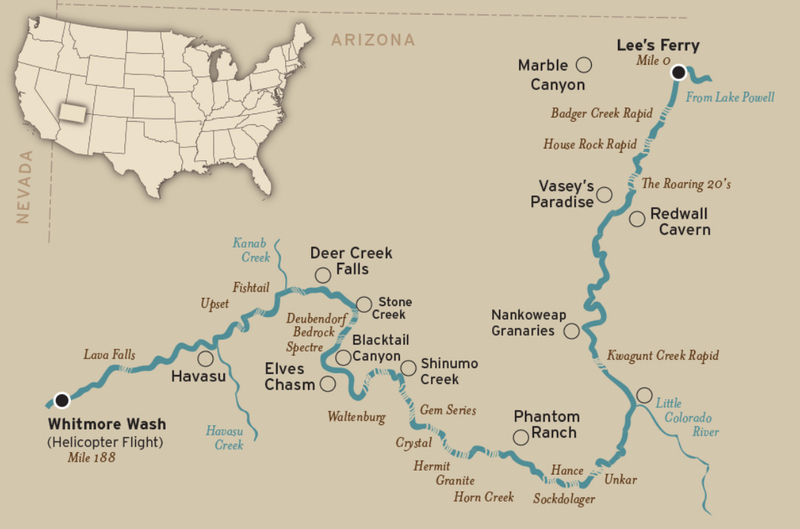 These are our conference hotels and they are also closest hotels to Arches and Canyonlands National Parks. We've reserved a block of rooms for our conference guests at a special discounted rate. Book your room now, as these rooms will go fast (you have until March 15, 2019 to cancel, should your plans change). The average rate for national brand hotel rooms in Moab is about $249/night. Your special rate for these beautiful Marriott rooms are $199 and $189 per night, respectively (normal rates in May are $293 and $273 per night)! 3:00 PM - Mike Berenson ~ Stacking, Tracking and Blending, Oh My! *The Milk Way core first appears each night at about 1:10 AM and remains visible until about 4:35 AM. 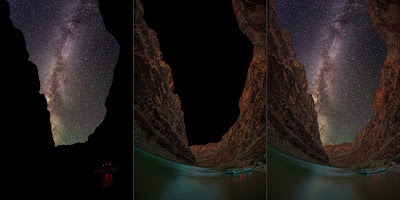 The Story: I woke up eleven days ago at 3:30 am on the 5th day of a Colorado River rafting trip with Western River Expeditions (that’s their boat on the bottom right); and found that the Milky Way core had finally rotated almost to the point that the Dark Horse Nebula could be seen at the bottom of the canyon. 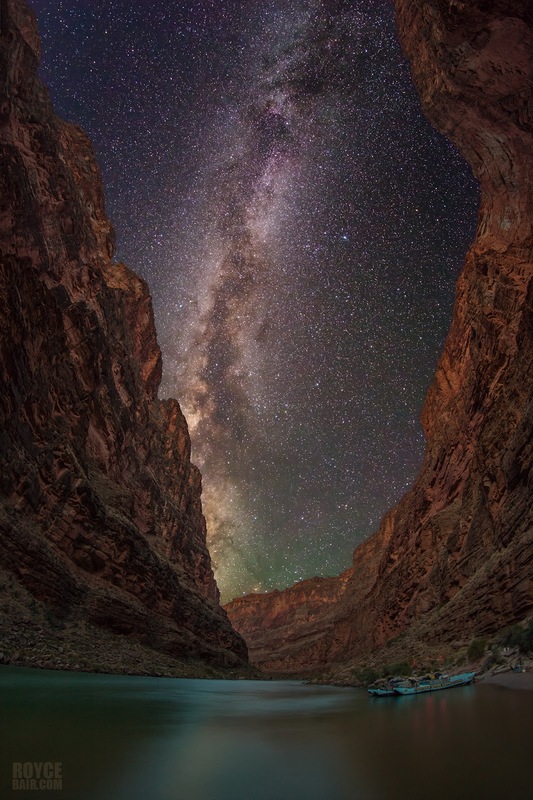 Five hours earlier I had gone to bed under the conclusion that the Milky Way core would not be revealed from this location (according to PhotoPills), before the Astronomical Dusk had ended, due to the high canyon walls. an area larger than many eastern states! PhotoPills had been right; however, even though the Astronomical Dusk (AD) was just ending, the view of the Milky Way in this 6,000 feet (1829 m.) deep section of the Grand Canyon was breathtaking, and I decided to wait another 15 minutes into the twilight, allowing more of the “horse” to be revealed and started an 8-exposure stack (to reduce digital noise) at 3:45 am. 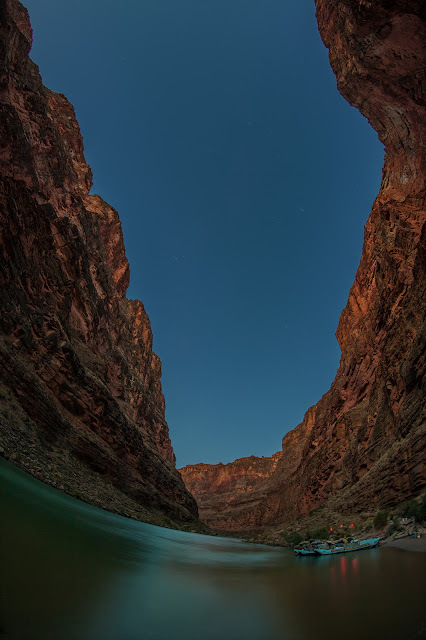 About a minute after I finished the stack, the bright yellow star, Antares, disappeared behind the canyon wall. After the stack for the Milky Way, I waited another 45 minutes into the Nautical Twilight (at 4:30 am) and did a 4-exposure stack for the foreground. The results of these two stacks were then blended in Photoshop. Although shooting past the Astronomical Dusk lowers sky contrast and makes the Milky Way more faint, it was worth it in order to place the core closer to its reveal and produce a better sky composition—reminding me once again that even though the AD is technically the best time to photography the Milky Way, there are esthetic and artistic reasons to fudge a little and wander into the Astro Twilight periods! How-to-Tutorial: Exposure stacking. Many wonder how effective stacking is in reducing digital noise. Although tracking is a better method of reducing noise and improving detail in the sky, for the small investment in extra field time, stacking is very effective. I often like to say that stacking is the poor man's method of tracking. It requires no extra equipment, only a little extra time in the field. 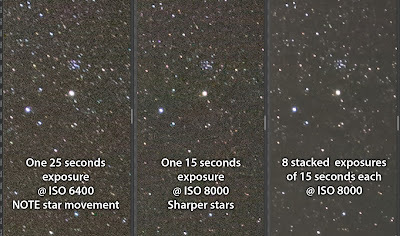 In this case, only eight 15-second exposures, or two extra minutes. Of course, one must spend extra time in post-processing to stack the exposures. I used Starry Landscape Stacker for the Mac. Windows users can use Sequator. Both software programs align the stars (which move between each exposure) and treat the foreground separately (which does not move). 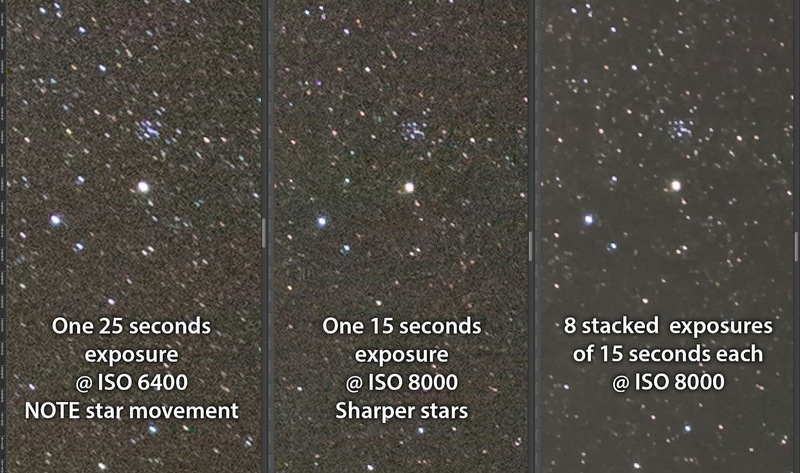 How many stacking exposures should you make? For starry night skies I recommend at least five shots, taking them as fast as they'll write to your memory card. The more you shots you take, the smoother the software can make the sky between the stars. Seven to nine shots is a good number. I find much more than this produces a diminishing return (less noticeable smoothness for your extra efforts). If you need to shoot the foreground separately like I did, four or five stacks is typically good enough, since foregrounds often have details (rocks and plants) that tend to hide noise. These three images were enlarged 200% in order to show show the digital noise (click to enlarge for more detail). At this enlargement, a standard 25 seconds exposure still shows some star movement or trailing. By reducing the exposure time to 15 seconds (and even shorter times when using longer focal length lenses) and compensating with a higher ISO, one can make stacking even more effective. Processing the sky exposure. Make sure you process your stacks as 16-bit TIFFs in order retain as much bit depth as possible. Once you have processed your stacked exposures into one image, you'll need to increase the sky contrast, especially in this case where I went into the Astronomical Twilight, which makes the Milky Way even more faint than usual. As explained in my other blog posts and in my eBook, I use ''S'' Curves to increase the sky contrast. Photoshop and Lightroom Curves does a better job of protecting Milky Way core highlight details than other processing methods. The left image is the Camera Raw exposure and the right image is after adding sky contrast, using an "S" Curves in Photoshop. 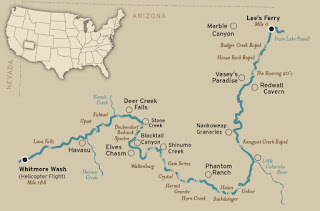 The red lights and reflections are weak blinking lights the river guides use to mark the trail to a hidden portable chemical toilet that makes river rafting more comfortable (and a national park requirement). The foreground exposure. In order to see foreground detail below the Milky Way sky, one typically needs to use an exposure that is at least 4 to 8 times greater than the sky exposure. To reduce noise, one should use the camera's Long Exposure Noise Reduction feature. Stacking exposures will further help. However, if one is close to an approaching twilight period like I was, one can wait and take that foreground about 45 minutes later like I did. You can also take a twilight exposure for the foreground before the Astronomical Dusk begins. This foreground exposure was taken during the Nautical Twilight, and was a stack of four 30-second exposures to further reduce noise. NOTE the fisheye distortion of the river's shoreline: this will be corrected at the end of the tutorial. 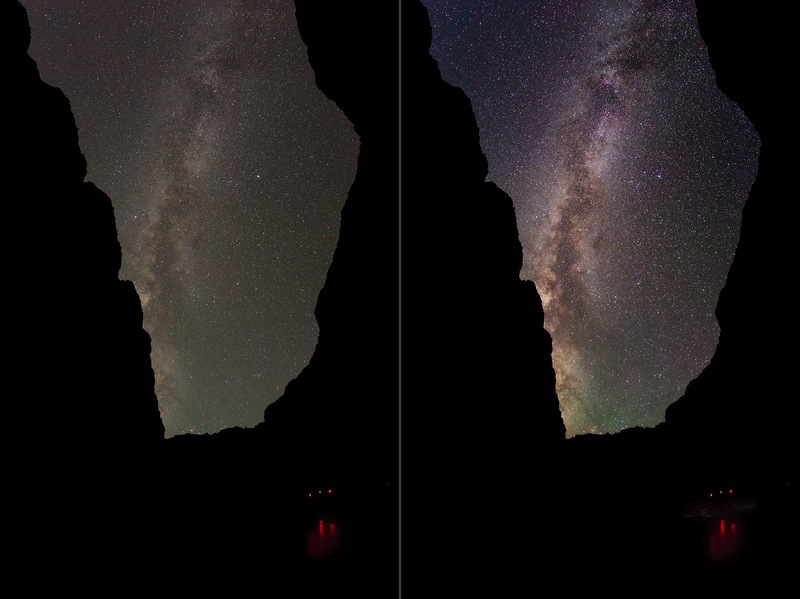 Blending the Milky Way and foreground exposures. 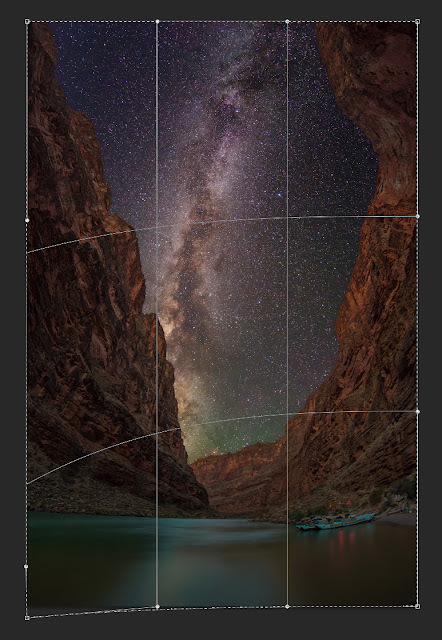 Using the sky as a masking channel and inverting the selection, the brighter foreground is selected, copied to the clipboard and then pasted as a layer over the Milky Way sky exposure. Once alignment is perfect, the layer is flattened into a final blended image. Exposure blends like this are NOT considered "composites" because the tripod and camera did not move. In fact, alignment blends are quite easy as long as both camera and tripod do NOT move between exposure! Click image to enlarge. Correcting fisheye lens distortion. This image was taken with the relatively inexpensive, but amazingly sharp (and very low coma) Rokinon 12mm f/2.8 ED AS IF NCS UMC Fisheye lens (made for Nikon | Canon | Sony E full-frame cameras). Using a fisheye lens enabled me to show the deep canyon perspective of this area. However, fisheye lenses exhibit extreme barrel distortion near the outside edges of the image, especially when they are tilted upwards! You can enable the Lens Corrections Profile in Adobe Camera Raw or Lightroom to remove this distortion, but it will greatly change the look of your image and typically destroy the image quality, especially near the edges. I've found a better solution is to selectively use Photoshop's "Warp" feature (Edit > Transform > Warp) only on the offending areas of your images. This correction feature enables more image quality to be retained and is much less destructive. Caution: always make sure you do this correction last, as any masking channels you have previously created will no longer align with your newly warped image! Often, only one or two corners of a "fisheye" landscape image need lens distortion correction. Once in the "Warp" submenu, I clicked on the far left corner of the river's shore line and dragged it straight down until the river looked more natural. Although the other corners of the image are just as distorted, their distortion is actually adding a unique perspective to the image and were left alone. A simple, ten-second correction! Subduing the blinking red lights. I could have removed the red lights and their reflection in the water, but they are part of the river experience, so I choose to darken them instead in the final image (top of page).